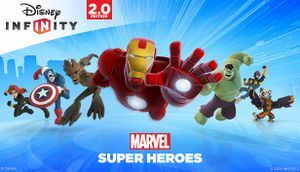 Also known as Disney Infinity: Marvel Super Heroes. Limited graphical options, such as a few limited resolution settings. Online features were disabled on September 30, 2016 due to franchise's cancellation. DLC purchasing disabled on July 29, 2016 for standalone PC and Steam versions, and on January 3, 2017 for Windows 8 version. Standalone PC version was disabled on September 30, 2016. Windows 8 version was disabled on March 3, 2017 along with all online features for all versions. Re-release with all content unlocked. All versions require a Disney account. This DLC list is from the former free-to-play versions. This list does not cover Hex Disc packs or individual characters (the list of playable characters can be found on the series' Wikipedia article). In-game purchases for standalone PC and Steam versions were removed on July 29, 2016 after franchise's cancellation. In-game purchases for the now-unavailable Windows 8 version were removed on January 3, 2017. Anyone who purchased DLC from the original Steam or standalone PC versions received the new "Gold Edition" for free. Anyone who only redeemed the former web code cards (even for play sets) did not receive the "Gold Edition" for free. Includes Marvel's The Avengers Play Set, three characters (Iron Man, Thor, and Black Widow), Escape from the Kyln and Assault on Asgard Toy Box Games, and full Toy Box access. Also includes Iron Man and Black Widow characters. Also includes Star-Lord and Gamora characters. Also includes Spider-Man and Nova characters. Includes all three above Marvel Play Sets, sixteen Marvel characters, both Marvel Toy Box Games and full Toy Box access. Includes Stitch and Merida characters, Brave Forest Siege and Stitch's Tropical Rescue Toy Box Games, and full Toy Box access. Includes Escape from the Kyln and Assault on Asgard. Includes Brave Forest Siege and Stitch's Tropical Rescue. Includes all characters that were released for the first Disney Infinity. Includes all twenty-one Marvel characters released for this game. Includes all twelve Disney Originals characters released for this game. Feature was disabled due to franchise's cancellation. See Network section below. Video options for the former Microsoft Store version (Note the "Render Resolution" and "Dynamic Resolution" options). For custom/unlisted resolutions, see the WSGF entry. Steam and standalone versions do not have vsync. Microsoft Store version has vsync on by default as a Universal Windows Platform app. Separate controls for camera, targeting, and flight. Options affect both mouse and controller. Former Microsoft Store version used to have this feature. Music, sound effects, and dialog. Online features were disabled for standalone PC and Steam versions on September 30, 2016, with standalone PC version being rendered unplayable on that date. Windows 8 version's online features and that version of the game itself were disabled on March 3, 2017. ↑ 1.0 1.1 File/folder structure within this directory reflects the path(s) listed for Windows and/or Steam game data (use Wine regedit to access Windows registry paths). Games with Steam Cloud support may store data in ~/.steam/steam/userdata/<user-id>/541660/ in addition to or instead of this directory. The app ID (541660) may differ in some cases. Treat backslashes as forward slashes. See the glossary page for details. This page was last edited on 13 April 2019, at 05:29.